Chesapeake Energy and its subsidiary Nomac Drilling have nominated themselves for worst pinkwasher of the year. 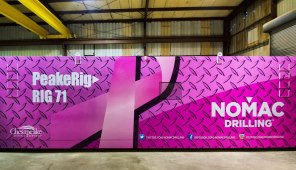 In case you missed it last week, Nomac Drilling has been promoting ”breast cancer awareness” by wrapping a new drilling rig in pink all while fracking the heck out of communities across the U.S. Fracking is an extremely toxic process used to extract oil or natural gas that exposes people to a variety of chemicals, some of which are linked to breast cancer. So last week, Breast Cancer Action activists, being generally intolerant of pinkwashing shenanigans, told Chesapeake Energy’s CEO, Aubrey McClendon to cut it out and commit his company and all of its subsidiaries to stop using chemicals that are linked to cancer. If you haven’t already taken action, there is still time! As the leading watchdog of the breast cancer movement, we are outraged that many chemicals involved in the fracking process are chemicals of concern, and that some have been linked to a higher incidence of breast cancer and could impact women living in nearby communities. We’ve always been staunch advocates of the precautionary principle, which requires us to act on information available to us, because as our friend and fellow activist Sandra Steingraber sagely points out, women will have to suffer and die of breast cancer to prove without a doubt that fracking can cause breast cancer. We know that breast cancer is the most common cancer aside from non-melanoma skin cancer among women in the United States and remains one of the leading causes of cancer death among women. An estimated 40,000 women will die of breast cancer this year alone. In the face of these deaths, we must take every precaution to protect women’s health and prevent more women from being diagnosed with breast cancer. The breast cancer epidemic cannot be solved through screening and awareness alone, and requires strong action to ensure that women are not exposed to chemicals that increase the risk of the disease. And while we’re working to address and end the breast cancer epidemic, it’d be great if companies manufacturing chemicals linked to the disease would stop profiting off it, whether financially or with the good PR. Fracking is a shamefully under-regulated process that is putting human health at risk. Chesapeake Energy and Nomac Drilling have proven themselves to be pinkwashers, and we will continue to push them, and the rest of the fracking industry, to put human health before corporate profit. We hope that you will join us. For more information about fracking, check out our friends at the Environmental Working Group’s webpage. This makes me so angry. Using someone dis ease to make money. I never believed in the pink ribbon. I know a woman who was in so much pain, so angry and so tired. She went to oregon and took her on life with friends and loved one surrounding her. I find nothing pink comforting or frilly about that . Thank you for uncovering the bull snaggle.